Learn about the history of biotechnology, life science, medical device, nutraceutical, and pharmaceutical companies and industry in Kansas. The following includes select facts from life science history, both global and Kansas state specific, that help explain the origins of the state's life science industry. Please note that these facts are part of a much larger state-specific history database that will be launched in the near future. In the meantime, we encourage you to learn about the scientists behind the discoveries, the entrepreneurs, philanthropists, political leaders, and significant events, institutions and companies that are the foundation of the life science industry in the state of Kansas. 1863 -- Kansas State Agricultural College (Kansas State University) was established. Kansas State University, or K-State, was was founded in Manhattan in 1863, during the American Civil War, as a land-grant institution under the Morrill Act. The university offers programs in arts and sciences, human ecology, agriculture, engineering, education, and veterinary medicine. The university also has a College of Technology and Aviation, now known as the Kansas State University Polytechnic Campus, located in Salina. In 2006, K-State dedicated the Biosecurity Research Institute that was designed and constructed for biosafety level 3 (BSL-3) and biosafety level 3 agriculture (BSL-3Ag) research. 1865 -- University of Kansas was established. The University of Kansas, or KU, was established in 1865 by citizens of Lawrence under a charter from the state legislature. The school was located atop Mount Oread on land donated by the former Kansas Governor Charles Robinson and his wife Sara. Today the university enrolls almost 30,000 students and offers programs in over 100 fields of study. The University of Kansas Medical Center and hospital, known as KU Med Center, is located in Kansas City, Kansas. The center offers a medical school and degree programs in audiology, dietetics, nursing, occupational therapy, pharmacology, public health, and other health-related fields. Kansas is often considered to be ground zero for the 1918 pandemic. In late January and early February of 1918, a local physician in Haskell County noticed a rash of severe influenza cases. Over the course of the next two months, influenza ran rampant through Haskell County, cutting a swath among the county's residents. By mid-March, the outbreak appeared to have run its course. By mid-October, authorities noted "cases in Kansas are increasing." 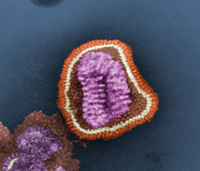 By late October, over 26,800 cases of influenza had been reported since the outbreak began in September. Influenza rates continued to climb even higher while deaths mounted. The disease peaked in the state during the late fall, but remained prevalent though out the state during the winter and spring of 1919. 1987 -- The Kansas Technology Enterprise Corporation was founded. Kansas Technology Enterprise Corporation (KTEC) was a private/public partnership established in In 1987 by the state of Kansas to promote technology based economic development. KTEC traced its origins to the 1980s when the Kansas economy was in a slump and the state's largest industries — aviation, oil & gas, and agriculture — were suffering from economic setbacks. KTEC's predecessor, the Kansas Advanced Technology Commission (KATC), began operation in 1983 with two employees and a budget of $200,000. KATC was created to assist with "high technology" projects. In 2011, the Kansas Legslature abolished the KTEC in a cost-cutting proposal by Governor Sam Brownback. 2000 -- Kansas City Area Life Sciences Institute was founded. Kansas City Area Life Sciences Institute (KCALSI) a 501(c)(3) not-for-profit organization that was founded with the mission of building the research base underpinning the regional life sciences economic development initiative in Kansas. The state's initiative was a product of the 1998 research retreat of the Civic Council Board of Directors, and the decision of James and Virginia Stowers to build the Stowers Institute for Medical Research in Kansas City. Today, the KCALSI and its stakeholder institutions share an ambitious goal—to excel in the areas of animal health/nutrition, biopharma/drug discovery, cardiovascular, neuroscience, oncology, and personalized medicines to become a national leader in biotechnology fields. KCALSI serves as the coordinating body for the Kansas City region’s life sciences research initiatives, specifically as broker, facilitator, matchmaker and potential funding organization for collaborative research initiatives. 2004 -- Kansas Bioscience Authority was founded. Kansas Bioscience Authority was created in April 2004 when Governor Kathleen Sebelius signed into law the Kansas Economic Growth Act (KEGA). An independent entity of the state, it is governed by a Board of Directors composed of prominent local and national leaders in the areas of science, technology, and business. The Kansas Bioscience Authority is a venture investor. KBA invests its own funds, attracts co-investors, manages its portfolio companies, and calls on its network of partners and experts to generate a return on and of invested capital. 2004 -- BioKansas was founded. BioKansas is a unified voice representing the biosciences in Kansas. Across the human, plant, animal and industrial biosciences, BioKansas is focused on enhancing the business and research climate and working with leaders across the state to attract and retain bioscience talent, companies and funding. 2006 -- Kansas State University Biosecurity Research Institute was dedicated. Kansas State University Biosecurity Research Institute dedicated the Biosecurity Research Institute (BRI) that was designed and constructed for biosafety level 3 (BSL-3) and biosafety level 3 agriculture (BSL-3Ag) research. The BRI supports comprehensive "farm-to-fork" infectious disease research programs that address threats to plant, animal, and human health. Home to 113,000 square feet of lab, education, and administrative space, this BSL-3, ABSL-3 and BSL3-Ag facility offers countless research and education opportunities. 2011 -- The Kansas Technology Enterprise Corporation was abolished by the Kansas Legislature. On July 1, 2011, the Kansas Legislature abolished the KTEC in a cost-cutting proposal by Governor Sam Brownback. The Kansas Technology Enterprise Corporation (KTEC), founded in 1987, was a private/public partnership established by the state of Kansas to promote technology based economic development. KTEC traced its origins to the 1980s when the Kansas economy was in a slump and the state's largest industries — aviation, oil & gas, and agriculture — were suffering from economic setbacks. KTEC's predecessor, the Kansas Advanced Technology Commission (KATC), began operation in 1983 with two employees and a budget of $200,000. KATC was created to assist with "high technology" projects. If you are aware of a notable event or person at your company or organization that should be included in Kansas Life Science History, please e-mail us at: suggestions@inforesource.org. Kansas Life Science History(TM) and Kansas Life Science Evolution(TM) © Info.Resource, Inc.